Several ideas for use of the waterfront streetcars have surfaced following reports of interest in acquiring them–but none of these ideas includes funding to buy or operate the streetcars. No offer is on the table today. The City of Seattle bought the streetcars from Melbourne, Australia in 1978, and transferred ownership to Metro Transit a quarter-century ago as part of the agreement for construction of the downtown Seattle bus tunnel. Two cars were added in the 1990s. Metro was proud to operate the streetcars on Seattle’s waterfront for nearly 20 years and has faithfully stored them for the past seven. But today the streetcars have no tracks, platforms, power supply or maintenance facility. They are stored in a warehouse that has only a few more years of useful life. Metro faces the prospect of having to spend significant money to relocate and store the streetcars, so it is important that we resolve questions about their future. We need to find them a new home. The City of Seattle is working on plans for a new waterfront when the Highway 99 tunnel opens. In the coming years city leaders will be making decisions on whether they want a modern streetcar to serve the waterfront. There is no offer on the table from any party now. The recent interest from another city has encouraged a public discussion on where the streetcars might operate locally. Metro is interested in finding a local buyer and operator for the streetcars. We have reached out to local cities and to local entrepreneurs, to find someone who can put the streetcars to good use. Metro is committed to exhausting all local options and will not forward legislation to the King County Council to sell the streetcars unless and until we have a viable local operator or are absolutely sure that none exists. Previous Previous post: Is your Metro service changing in September? There is nothing that I miss more about downtown Seattle than the beautiful streetcars that ran along the waterfront. 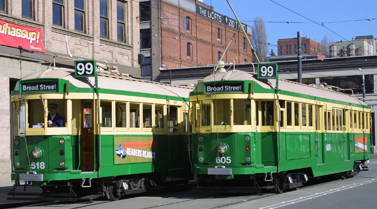 If we are trying to make Alaska Way into a beautiful waterfront boulevard park, then there is nothing that could complete it better than the truly majestic Australian streetcars that mirror Seattle’s streetcar history. Furthermore, Seattle has a set of historic and modern attractions, from SAM Sculpture Park, Pike Place Market (via the hilclimb), the Aquarium and Historic Piers, to our beloved pioneer square that can all be easily connected for residents and tourists alike with the character-rich streetcars. No modern bus system or streetcar system can create such a joyous connection between those destinations. The streetcars offer an elegance of travel in a bygone era in a way that nothing else can!! To let them get away would be a scandalous crime!! PLEASE SAVE THE magnificent, wonderful Australian Streetcars! They’re great & I really miss them!! It would be a horrible mistake, a tragedy, a travesty, to let these historic 1927, magnificent, wonderful streetcars (with their Tasmanian mahogany woodwork!!) that Mr. GeorgeBenson worked so hard to obtain for us slip away!! Plus, they are fully accessible for disabled riders!! PLEASE, SAVE these Magnificent Trolleys!! Thank you! While i understand the problems metro faces with the streetcars i think its importaint that they be kept in their home in seattle to once again provide service on the waterfront. The acts of a former county executive and a art museum should be criminal, and last time i was down there 90% of the infrastructure is still in place, and what is not could be easily fixed. The recent study provided by the sports teams and stadium authority have a viable solution to the carbarn situation, and the voltage diffrence is easily fixed – just look at the 1940s trolleybuses and their dropping resistors. What role the streetcars have in the new waterfront is something that metro and everyone else should be encouraging their use and return to service as i dont think “pedicabs and jitneys” as one plan for the waterfront had it will be able to adiquately provide a meaningful and viable gransportation service on the waterfront. Ever since the line closed in 2005 i havent been going down the the waterfront as much as i used to, and it appears many others have not been as well. The waterfront the few times i have been down there since has not been as busy as it once used to be and pioneer square seems to be suffering a lot as well. Not only did the benson line provide a meaningful and viable transportaion solution to the waterfront it was a landmark for locals and tourists alike, and it would further dishonor george bensons memory, and hurt businesses and our transportaion network if the line were to dissapear entirely.